Click the banner below to listen to interviews about films from a Christian perspective with Pastors Ted Giese and Todd Wilken on IssuesEtc.org. 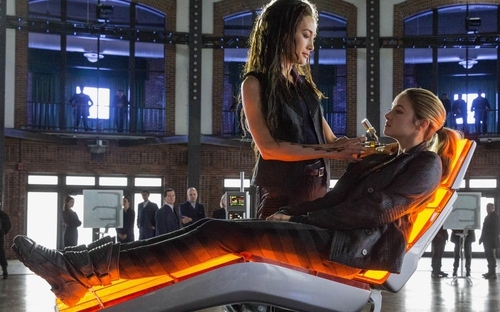 In a scene with the heroine Beatrice (Shailene Woodley) in the film Divergent, (based on the book of the same name), the villain Jeanine Matthews (Kate Winslet) says, “I think human nature is the enemy. It's human nature to keep secrets, to lie, to steal, to be destructive. I want to eradicate that. That’s how we’ll maintain a stable, peaceful society.” This premise of the film is never disputed. There is no "good guy" spouting off about how wonderful human nature is and how it should be embraced. Every character in the film knows there is great temptation to abandon virtuous living and the “Faction system” at the heart of this dystopic story is an attempt to do an end run around that temptation by encouraging people to embrace their dominant virtue. And not just embrace it, but work at it, study it, and attempt to thrive in that particular virtue. The trouble is that with each virtue there is a flipside—the closer one moves towards virtue the more challenging the temptations become. The factions within the story all struggle with something the western world outside the story, in everyday life, used to universally call sin. In fact, at its core, Divergent is a story about a particular kind of sin that has become even more unpopular: original sin, the sin people are saddled with because the world is a broken place in need of redemption. This is the Sunday-school-Adam-and-Eve-in-the-garden-with-the-serpent-and-the-forbidden-fruit original sin, the sin that breaks the world and breaks human nature. Is it a stretch to say Divergent is a movie that deals with original sin? Not at all. In her acknowledgments at the end of her popular novel, Veronica Roth, the author of Divergent starts out by saying "Thank you, God, for your Son and for blessing me beyond comprehension." This is no abstract amorphous spirituality. This is a very specific God, a God with a Son. That Son would be Jesus, which makes Veronica Roth a Christian author. And while the movie isn't overtly Christian the themes in it are quite near the surface and glancing briefly at the book it doesn't take too much leafing around to see these themes are more overt, popping up like a periscope throughout the novel. One of these key themes in the film is baptism. In a Christian church baptism only takes a couple of minutes and in the film the "baptism" itself goes by rather quickly as the character of Beatrice moves from one Faction, the selfless Faction Abnegation, to the brave Faction Dauntless, from that moment forward, baptism as a theme is apparent repeatedly. One of the first tests of bravery Beatrice is given is jumping off a building without knowing what's ultimately beneath her. At the bottom of the jump there's a net and when she lands safely and she's removed from the net she's asked what will be her name in Dauntless. She's told she can't change it afterwards. She could have just used her original name and that would be fine, but she gave the name Tris instead of Beatrice. This is one example of a detail within Divergentthat lines up with the practice of Christian baptism. While the Bible doesn't say people must take on a new name at baptism, the Christian practice of including a naming ceremony within baptism is drawn from the Bible. Individuals like Abram who became Abraham , or Jacob whom God renames Israel , and Simon who Jesus renames Peter , or the Christian persecutor Saul who becomes the Christian Paul are examples of believers names and lives changed by God. Baptism is an important part of a Christian’s life being changed. It's also interesting that while Beatrice seems like she's choosing to trust when she jumps off the building into the unknown that someone had already devised the test and set up the net below her. The dramatic tension within the film then works on two levels. On one level is a conflict between these various Factions which is typical in a teen fiction action drama and is recognizably drawn from other sources like Harry Potter, and The Hunger Games. But on another level the dramatic tension comes from an interplay between the virtuous life and the temptations inherent in seeking to achieve outstanding virtue. The theme of baptism is the nexus in this. Divergent gives the viewer characters who are trying to be good, virtuous members of society but who also struggle with the fact that their baser side, that original sin, keeps desiring to swim to the surface of their thoughts, words and deeds. There is a Latin phrase for this interaction: simul justus et peccator. This phrase means that the baptized person is at one and the same time saint and sinner, or better put, both righteous and a sinner. The heroineBeatrice/Tris in Divergent and even the villainJeanine Matthews are prime examples of this in the narrative. While themes like this run through other teen fiction movie franchises Divergent seems to get the balance right. Simple enough to be accessible to its teen audience, satisfying enough to engage its adult audience Divergent is full of encouragement towards virtue without false hope. In a nutshell Divergent tells a story about how striving towards virtue is not without its pitfalls. Injecting the story with a frank and honest investigation of these pitfalls makes its push towards redeeming its dystopic world all the more interesting. With movies like Son of God and Noah being directly marketed to Christians, Divergentas a Christian story seems to be slipping under the radar while hitting the top of the box office.